We first heard from the Jersey City brother duo PM Dawn in ’91 with their debut album Of The Heart, Of The Spirit And Of The Cross: The Utopian Experience, which earned the Cordes boys a gold plaque, thanks largely to the crossover hit “Set Adrift On Memory Bliss”. While PM Dawn was praised by hipsters and pop music critics alike, they received the cold shoulder from most of the hip-hip community, who found their brand of hip-hop too soft and corny. Back in the day, I also wrote them off as corny, but after finding their debut in the dollar bin and listening to the album in its entirety for the first time last year for this blog, I actually found it pretty enjoyable (read my thoughts on it here). No, it’s not your traditional hip-hop album, but time and maturity helped me appreciate Prince Be’s parables and the duo’s smooth jazz/folksy production sound. PM Dawn would return in 1993 with their follow-up, The Bliss Album…? (Vibrations of Love and Anger and the Ponderance of Life and Existence), and like it’s predecessor, it would earn brothers Cordes another gold plaque, heaps of critical acclaim from hipsters and pop critics, and leave hip-hoppers with a stank face. Sadly, on June 17, 2016, after years of health issues, Prince Be passed away from compilations related to his diabetes, at the still relatively young age of 46. Upon his death The New York Times said PM Dawn was “both underappreciated and quietly influential”. Even if you didn’t like PM Dawn you have to admit they helped opened the lane for abstract acts like Arrested Development, Outkast, and later the emo-rap movement led by the Drakes and Kid Cudis of the world. Rest in peace, Prince Be. (And rest in peace to my Aunt, Wanda Marie Cotton, who passed away on July 15, 2016). Intro – The Bliss Album…? opens with a soundbite from a man speaking about “strange words” and the importance of understanding them (which anyone slightly familiar with PM Dawn, knows can be challenging at times), followed by a soundbite from a woman (who sounds like either Wendy or Lisa from the Purple Prince’s (rip) band The Revolution) describing “Prince”, which PM Dawn uses to describe the voice of their two-man crew, Prince Be. When Midnight Sighs – I’m not sure what the hidden meaning is in Prince Be’s softly spoken word lyrics. Is he speaking from the perspective of a righteous God unhappy with the sins of his creation? Or did Prince Be actually sit up and weep every night as the clock stuck twelve? And how exactly does midnight sigh? Prince Be’s lyrics may be a bit too abstract, but I actually like the mellow instrumental playing underneath him. 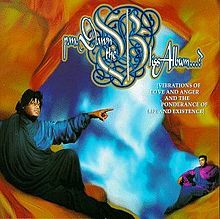 So On And So On – PM Dawn builds this backdrop around a loop from David Batiste & The Gladiators “Funky Soul” (that they would later be sued for sampling, but would walk a way victorious as a judge would rule in their favor). Prince Be puts on his singing cap for this semi-gospel/pop joint. No this is not a “hip-hop” song, and I completely understand if you don’t like it, but I kind of like its funky popish vibe. Plastic – Prince Be decides it’s finally time to spit a few bars, as he confronts the many haters and naysayers who considered him too soft or a wack sellout for his pop/hipster style. This song may contain the strongest rhymes I’ve ever heard Prince Be spit (not that we have a lot to work with, I’m just sayin’), and the funky backdrop was kind of nice. The Ways Of The Wind – Prince Be sings over an airy instrumental, and it ends up being a decent pop joint. To Love Me More – Over very soft music (this one doesn’t even have drums) Prince Be goes into croon mode. His lyrics can be taken as a love song to his significant other or a love song to God. Not a terrible song but it sounds a little bit too much like another song on this album (that will discuss in a little taste). About Nothing (For The Love Of Destiny) – This is another one I wouldn’t consider a hip-hop record, but I’m digging the hipster groove on it. Norwegian Wood (This Bird Has Flown) – This is a remake of The Beatles song with the same song title. I’m not a fan The Beatles version or PM Dawn’s take, but I did kind of dig the guitar riff (which sounds like it may have been lifted from Prince’s guitar solo at the end of “Let’s Go Crazy”. Prince isn’t credited in the liner notes, so I could be wrong.) brought in during the hook. Beyond Infinite Affections – Finally, Prince Be decides to spit bars again. On this one he discusses life, life after death and faith in God (I think?). Be’s lyrics are okay, but the dope jazzy piano loop helps make this the strongest hip-hop song on The Bliss Album…? Looking Through Patient Eyes – The second single from The Bliss Album…? uses elements from George Michael’s’ “Father Figure” and reminds me a lot of “The Ways Of The Wind”. Only Prince Be decides to go back in to his airy spoken word style instead of singing. Not really feeling this one. Filthy Rich (I Don’t Wanna Be) – Prince Be tip toes over this soft backdrop with his poetry, that is too abstract for my liking. Being that PM Dawn were Christians, I’m assuming the concept of this song is based on the Biblical scripture from Matthew 19:24 or Mark 10:25, which both talk about how hard it is for a rich man to enter the gates of heaven. Not a fan of this one either. More Than Likely – Prince Be invites Boy George to help him with this duet that was also released as the third single from The Bliss Album…? I’ve never considered Boy George a great singer, though he seemed to sound decent on most of his eighties pop records. But the acoustic backing on this one exposes all his vocal flaws, and his nasally vocal tone quickly becomes a nuisance to the ear. This one is terrible. The Nocturnal Is In The House – This is easily the hardest track on The Bliss Album…? Prince Be puts a little bass in his voice and spits boastful bars on the mic. The backdrop is cool but Prince Be’s rhymes are garbage. When It’s Raining Cats And Dogs – I’m a sucker for a sick bass line, and this song has a funky one that is bound to get your head nodding, no matter how hard you try to deny it. This actually sounds like something The Weekend might do today. As long as you’re not looking for a pure hip-hop record, you’ll appreciate this one, a little taste. I’d Die Without You – This was also included and released as a single off the The Boomerang Soundtrack in 1992, and is arguably the biggest hit in the PM Dawn catalog (and the song I felt “To Love Me More” aped). Over a soft and soulful instrumental, Prince Be’s in croon mode as he lets the objection of his affection know she is the sole reason that he continues to breathe. Yeah, it’s a bit cheesy and sappy, but this is still a really good song. Even if it was released today I think it would be a hit. Timeless classic. While PM Dawn’s Of The Heart may have been a bit too abstract, soft, emo or corny, for most hip-hop heads to digest, the fact that Prince Be was actually rapping (or spoken wording) on the majority of the album, qualifies it as a hip-hop album. The Bliss Album…? , is absolutely not a hip-hop album. Prince Be spends the majority of the album as a pop r&b singer, crooning over airy pop instrumentals, only spitting rhymes on special occasions. That said, if you can look past Prince Be’s severely coded riddles (or are willing to take the time to decode them) and take The Bliss Album…? for the pop record that it is, you’ll appreciate a sizable amount of the album, or at least the instrumentals.